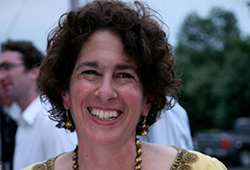 In January 2013, Portland's Jewish community lost Emily Georges Gottfried z"l, one of our most enthusiastic and dedicated champions. Emily passed away after losing her battle with a rare autoimmune disorder. Her absence is felt not only by the Jewish community but by the multitude of individuals she worked with around Oregon to combat hunger and promote justice and interfaith dialogue. "For most of her life, Emily's work was framed within the Jewish organizations, but her concerns were always universal," says Andra Georges, Emily's sister. "Emily fought for individual respect and human rights, against hate crimes and hunger." In March 2013, Emily's family opened a donor advised fund at OJCF to honor her memory and life's work. The Emily Georges Gottfried Fund is dedicated to carrying on her mission by supporting initiatives and programs that open dialogue among people of different faiths, cultures and socioeconomic backgrounds. The fund, which is being managed by Emily's family, will provide grants to organizations focused on bringing diverse communities together to learn, discuss, celebrate and take action. In June 2013, the Oregon State Legislature unanimously passed a resolution honoring Emily's impact upon the state. Testimony was provided by Christians, Muslims and Jews alike attesting to Emily's dedication to bridge building, social justice and human rights for all. According to Ms. Georges, "Emily believed in inclusion and there was room for everyone at her table." To date, more than 40 gifts have been made to the Emily Georges Gottfried Fund from individuals and organizations nationwide. If you would like to learn more about Emily's fund, please visit www.emilysfund.org.